8th November 2018: The grueling distance of a marathon race has become an ultimate in distance running in the world. Athletes around the world are mastering the art to better the records, set and broken time and again, and dominate the world stage. Marathon titles have lured millions of athletes around the world, but only a few of them succeed to lift the titles. A marathon is still considered one of the toughest races in the world of athletics. It takes perfect discipline to train hard, overcome one’s limit and persevere for years before succeeding on the world stage. Competing against time, weather, distance and tough contenders – the race has become an epitome of endurance, stamina, grit and gumption. Kenya’s Mary Keitany has stamped her dominance in the New York City Marathon. She clocked 2:22:48 to win her fourth title in the 2018 New York City Marathon edition. One can imagine her dominance at the New York City Marathon. In the 9 outings at the New York City Marathon, this was her 6th podium finish, since she stood 3rd in the 2010 edition. She did not compete in the 2012 and 2013 editions, so that makes 6 out 7 races Keitany had competed so far. Mary Keitany made her Marathon debut at the 2010 New York City Marathon. She clocked 2:29:01 to win the Bronze medal. A year later in 2011, she clipped almost 5 and a half minute to better her timing to 2:23:38 and replicated her last year’s performance. She skipped the 2012 and 2013 Seasons to pursue motherhood. She returned with a vengeance to win the 2014 New York City Marathon title in 2:25:07. 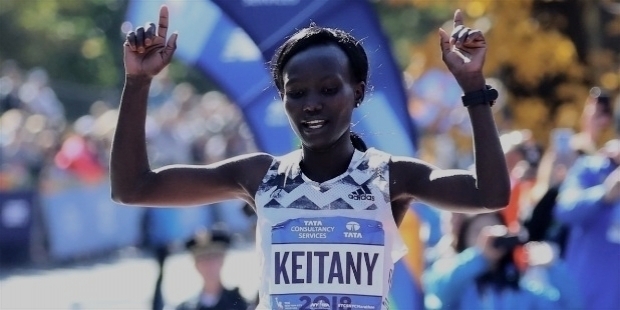 Keitany has shown immense talent and grit at the New York City Marathon. She simply loves the familiar course to dominate over her fellow competitors. 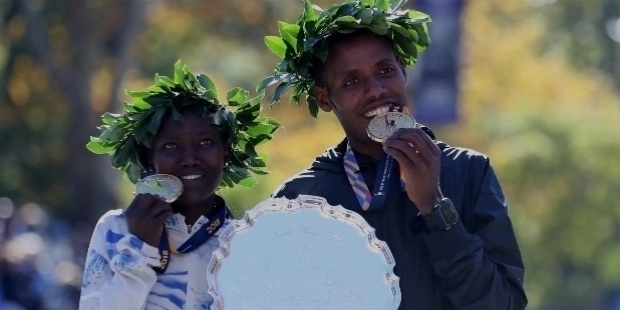 She repeated her superb form to win the second title at the 2015 New York City Marathon edition clocking 2:24:25. At the 2016 edition, Keitany completed the hat-trick to stamp her authority over the course. She clocked 2:24:26. She was becoming hard to beat at the course. 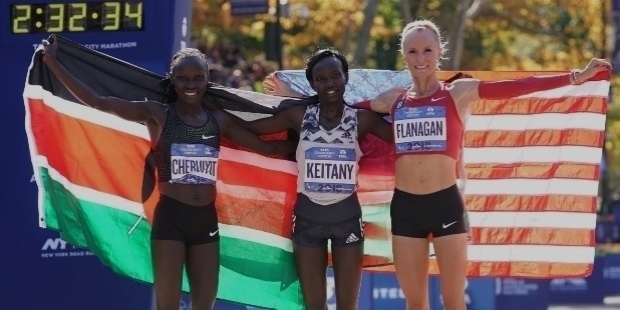 2017 saw the emergence of American Shalane Flanagan to put a stop on African marathon champions. She emerged victorious at the 2017 New York City Marathon with a 2:26:53 beating Mary Keitany. The 36-year-old Kenyan went home to train even harder and prepare well to avenge her 2017 defeat. At the 2018 New York City Marathon, Keitany was in superb form. Right at the beginning of the race, Keitany dominated her fellow competitors. She was far ahead than the rest of the pack. As soon as Keitany hit Manhattan, she led the field running alone. She accelerated the pace to such an extent that none of her opponents could match her speed and momentum. She crossed the tape, just 17 seconds off the course record, clocking 2:22:48. Compatriot Vivian Cheruiyot was more than 3 minutes behind the Champion, followed by Shalane Flanagan. Cheruiyot clocked 2:26:02 for the second spot, while Flanagan crossed the finishing line in 2:26:22. In spite of American distance runners right on Kenyans’ heels, the African nation not only displayed great panache to emerge winners, but also broke their confidence with their calculated pace and plan. Mary Keitany etched her name in the records books by becoming the only second woman to win the New York City Marathon title four times. Norwegian Grete Waitz is the greatest marathoner, who had won New York City Marathon title a record number of 9 times, from 1978 to 1988. Keitany’s 2:22:48 was the second fastest time for a female runner in New York City Marathon history. Kenya's Margaret Okayo holds the course record at 2:22:31, clocked in the 2003 edition. Even after a decade and a half, Okayo’s record remains unchallenged. Mary Keitany is the World Record holder in a ‘women-only marathon’. She had won the 2017 London Marathon, clocking 2:17:01. Mary Jepkosgei Keitany was born in Kabarnet, Baringo County of Kenya on the 18th of January 1982. A gifted runner, Little Mary started running in her Primary School. However, she joined the Hidden Talent Academy at the age of 20. She has shown great potential in the world of athletics and distance running. She has dominated the New York City Marathon and London Marathon and has had 4 and 3 times victory respectively. Mary came in prominence in 2006. She clocked her personal best of 16:29.4 for 5000m in Nairobi. She won the Sevilla Half-Marathon in Spain and Sao Silvestre Olivais 10K race in Portugal. In 2007, she was in superb form to win three Half-Marathon titles in France and Spain. She also won the Gold medal in Puy-en-Velay 15K race. She competed at the World Road Running Championships in Italy. Mary won the Silver medal behind Lornah Kiplagat in the World Record breaking race. 2008 saw Mary becoming a mother. She began training as soon as she recovered from delivery. A fierce fighter, Mary returned to international competition. In May 2009, Mary clocked her personal best at the World 10K in Bangalore, bagging the Silver medal behind Aselefech Mergia. Later in September 2009, she won the Gold medal at the Lille Half-Marathon in Paris. She clocked the seventh fastest of all-time, clocking 1:07:00. Keitany’s Lille performance qualified her for the World Half-Marathon Championships in Birmingham, UK. Mary went onto win her first World Championships title, outpacing Aberu Kebede. She clocked her personal best of 1:06:36 to break the Championship Record. Mary also won the Team Gold medal for being a part of the victorious Kenyan Team in the ‘Team Competition’. Keitany broke the African Record for Half-Marathon set by South African runner Elana Meyer, clocking 1:06:36. She also broke the Kenyan Record set by Udine. It was New York City Marathon Director Mary Wittenberg, who had seen and stated that Mary Keitany has immense potential to become a world-beater over full marathon distance. Keitany took Wittenberg’s advice seriously and concentrated on her training schedule in preparation for 2010 New York City Marathon. She went onto win the 2010 Abu Dhabi Half-Marathon and Berlin 25K race in a record time of 1:19:53. She broke Japanese Mizuki Noguchi’s 2005 record. In September 2010, Keitany won the Portugal Half-Marathon clocking 1:08:46. Making her debut run at the 2010 New York City Marathon, Keitany was little inexperienced to judge the race. In spite of being in the leading three, Keitany finished third crossing the line in 2:29:01. This was just the beginning for Keitany’s love for New York City Marathon. Mary Keitany was now confident as a runner to take on the world. In the 2011 Season, she established the World Record for Ras al Khaimah Half-Marathon, clocking 1:05:50. Mary became the first-ever woman to run the distance under 1:06 hours. She also set the World Record for 20K with a time of 1:02:36. In her first attempt at 2011 London Marathon, Keitany crushed her competitors to claim the title, clocking 2:19:17. She became the fourth fastest woman ever to run below 2:20 hours over the distance. Keitany won her second title at the 2011 Portugal Half-Marathon with an improved timing of 1:07:54. She finished third at the 2011 New York City Marathon behind Firehiwot Dado and Buzunesh Deba. Mary Keitany repeated her winning performance at the 2012 London Marathon. She clocked 2:18:37 breaking African Record, established by Catherine Ndereba. 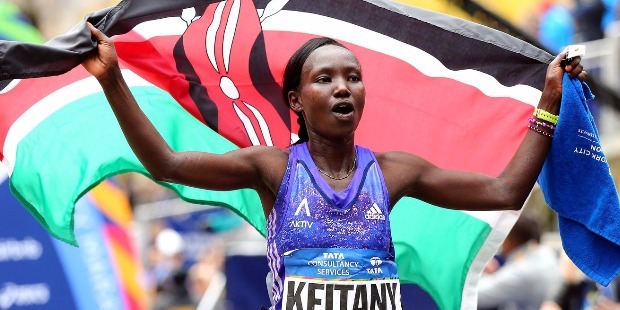 Keitany became the third fastest woman ever over the distance. At the Summer Olympics, Keitany missed the podium finish coming fourth in the fast-paced race. 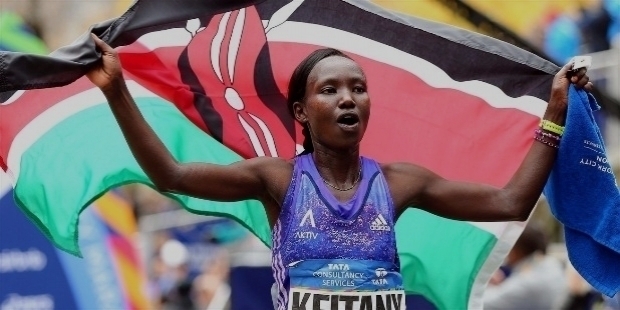 Keitany took a year’s break to give birth to her child in 2013. She returned back immediately after her delivery with much vigor and grit. 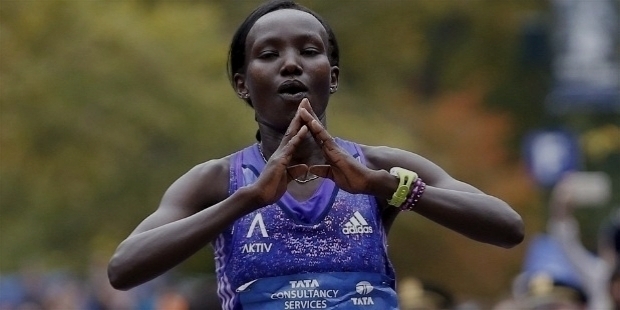 She won the 2014 New York City Marathon clocking 2:25:07 defeating Jemima Sumgong. Keitany won the second title at the 2015 New York City Marathon, clocking 2:24:25. 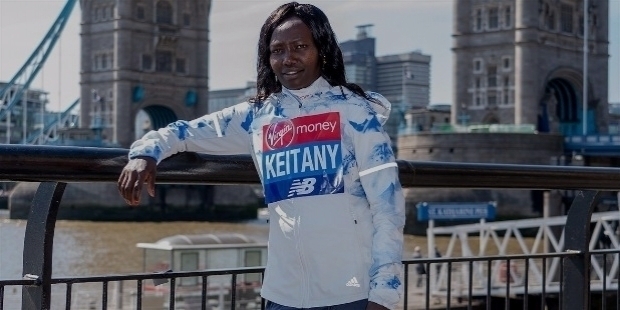 The wind and cold conditions at the 2015 London Marathon brought the worst fear in Keitany. She was one of the favorites to win the title. However, Ethiopian Tigist Tufa got the best of her to win the title. Keitany registered her authority at the New York City Marathon by completing the hat-trick winning the 2016 edition. She clocked 2:24:26 ahead of Sally Kipyego and Molly Huddle. At the 2017 Ras Al Khaimah Half Marathon, Keitany finished second behind Peres Jepchirchir, who set a new World Record time of 1:05:06. Keitany won the 2017 London Marathon with a new World Record for women-only, clocking 2:17:01. She broke Radcliff’s 2005 record by 41 seconds. Keitany also completed her hat-trick at London Marathon winning the title in 2011, 2012 and 2017. Mary Keitany is married to Charles Koch. They have a son and a daughter, named Jared and Samantha respectively. Currently, Keitany trains at the Adidas Camp in Iten. She is managed by Gianni Demadonna.